"We have recently installed new SCHENCK Balancing Machine Model H 70 U / BU + CAB690. Capacity: 30 Kgs. To 30,000 Kg End Drive and Belt Drive. These types of Machines are ideally suited for Jobs with high inertia and where high power is consumed due to air resistance, etc. The weight of Rotors which can be balanced is limited by acceleration capacity of drive unit and speeds available on the Balancing Machine. 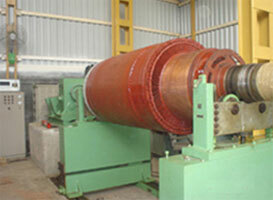 These Machines are suitable for Balancing of all bigger Rotors of Heavy Machine Re-builders / Re-winders, and are also suitable for Balancing of the above Rotors at various RPM as per Job weight specification, and balancing of all bigger Rotors, ID/FD Fans, Fibrisors of Sugar Plants, large Blower Impellers of Cement Plants, Power Plants, etc, as well as for Balancing of Rotors weight upto 5 Tons at rated speed of 1500 RPM and 3000 RPM also." This Machine is suitable for Small Armatures,Rotors Turbochargers, Spindles,Motor Cooling Fans,Small rigid & flexible Rotors etc. 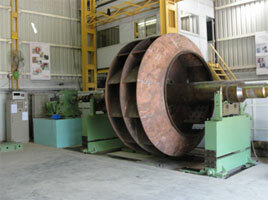 The photo shows job of MAN TURBO turbo charger rotor, through their vendors, being balanced at the speed of 2500 RPM. This Machine is suitable for Small rotors, gear shafts, armature, pulleys, brake drums, rigid and flexible rotors weighing upto 700 kg. 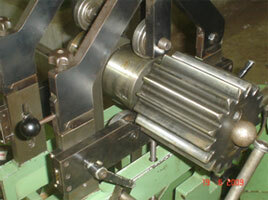 The photo shows job of Flender Limited for traction motor drive pinion, at a Balancing speed of 3500 RPM. This Machines is suitable for Balancing of Rotors, Motor rotors, Centrifuges, Separators, Decantor Bowl conveyor assembly,etc. 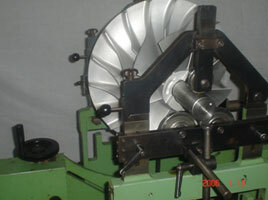 This machine is suitable for rotating machines at lower / medium and higher speed jobs weight with 5.5 tons. The above image shows typical job of weight having 2.5 Tons being attended by us for Siemens for their Railway traction application .The Job has been undertaken at our Rabale Balancing facility. 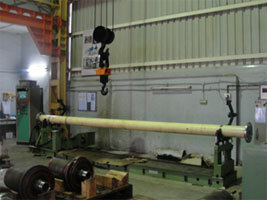 plant drive shafts, erector drive shaft, etc,. Weight upto 5.5 Tons. The above image shows typical job of weight having 1.5 Tons & length of 6.5 mtrs being attended by us for Greater Mumbai Municipal Corporation for their Water processing application through their vendors.The Job has been undertaken at our Rabale Balancing facility. 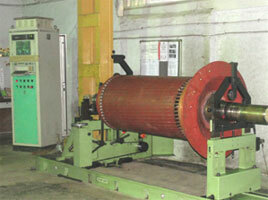 This Machines is suitable for Balancing of all bigger Rotors, ID/FD Fans Fibrisors of Sugar Plants, large blower Impellers of Cement Plants, Power Plants, etc,This machine is suitable for Balancing of the above rotors at 200 / 400 RPM, as per job weight specification The above image shows typical job being attended by us for L & T through their vendors. The Job has been undertaken at our Rabale Balancing facility. job weight specification.The above image shows typical job of weight having 12.5 Tons being attended by us for Bhushan Steel, through their vendors.The Job has been undertaken at our Rabale Balancing facility. Our In-House Balancing Capacity is from 0.5 kg to 15 tons.Facility for handling of this jobs. 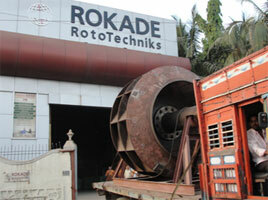 We have various capacity Jib / EOT Crane for proper handling of jobs with weight upto 15 tons. Thus, it is ensured that all the jobs are handled with utmost care to avoid even minor damage.The above image shows typical job weighing 15 tons being taken up for balancing. 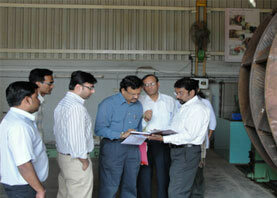 facilities and also witnessed QC / QS for our various Clients.